Much has been made about the flag that was picked up by officials after they called defensive pass interference in the Lions’ 24-20 loss to the Cowboys on Sunday. Anthony Hitchens was flagged for pass interference on the Lions’ tight end Brandon Pettigrew. The officials could have thrown in defensive holding too since he tugged on Pettigrew’s jersey. Also Dez Bryant ran onto the field to argue the call with the officials without his helmet. That could have been a 15-yard penalty in itself. But let’s forget all of that for a second (try if you can). The Lions lost for a few basic reasons. They could only put up 3 points in the second half and they killed themselves by losing the turnover battle. They lost a fumble and Matthew Stafford threw an interception (it was tipped, wasn’t really his fault, but it was a turnover). The timing could not have been worse. It happened on the first play of the second half. The Lions were up 17-7 and knew they had to come out and put more points on the board. Then with a minute left, on a fourth-and-3 at Dallas’ 42, Stafford was stripped on a sack in the final drive when the Lions were going for the win and lost the ball. It was recovered by DeMarcus Lawrence. Game over. Stafford was sacked three times which is unacceptable in a playoff game even if the starting right tackle and right guard are rookies. The mistakes were minimal but costly. Can’t happen in the playoffs. Tony Romo didn’t throw an interception. 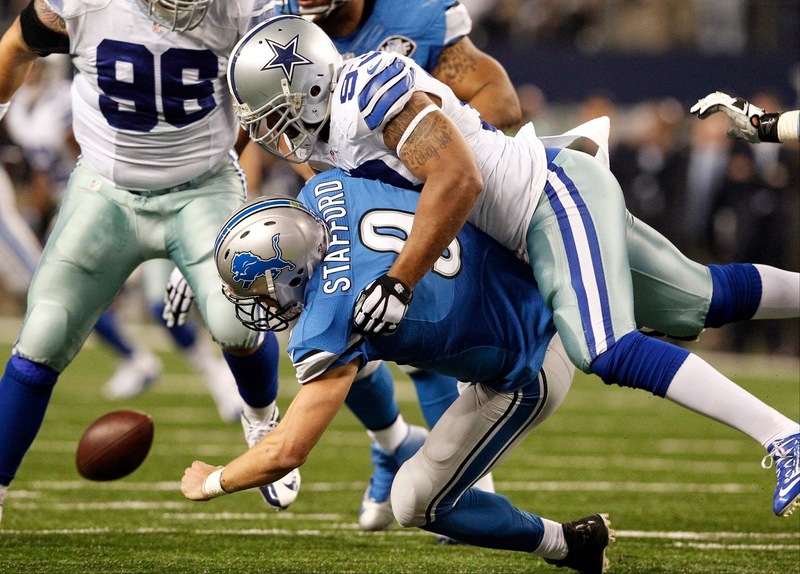 They did lose a fumble in the fourth on another strip sack of Stafford. Lawrence fell on the ball but lost the ball when Garrett Reynolds punched it out and Reiff recovered. Teams that win the turnover battle typically win ball games.